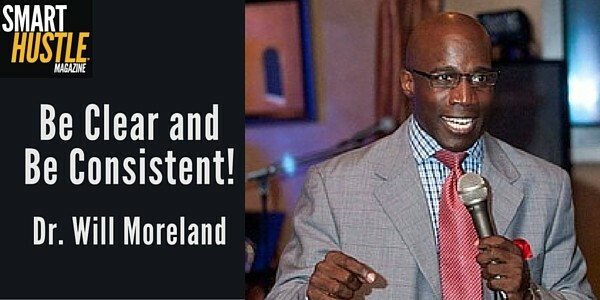 Dr. Will Moreland is a successful speaker, author, and coach who decided early on that he was not going to let his start determine his finish. Growing up in Compton, California, he lived with his single mother in a city that was facing serious drug, crime and gang problems. His father was in jail, he had a speech impediment and also suffered from low self-esteem. Flash forward to today, Will is a best-selling author who has given over 1700 presentations on leadership and personal development. Recently, Will joined me for an exclusive Smart Hustle interview where he shared valuable advice for small business owners. Will currently runs a leadership development company where he works with Fortune 500 companies, universities, and schools in order to help them build leadership teams and a leadership culture. He believes that “Everyone is a leader, the only question is, what type of leader are YOU?” His coaching sessions help people understand that leadership is not about a title or a position; leadership is about influence, so it is a skill that everyone must develop. Beyond that, Will says that he is an entrepreneur at heart and loves helping entrepreneurs and small business owners out as well. I’d like to focus on his two main pieces of advice for small business owners, but I encourage you to listen to the entire interview by clicking play below. When asked about the themes that he sees with today’s business owners, Will mentions that many business owners he consults with are at a critical stage of identity. When you think of identity, you likely think of personal identity (the question of who am I?) but in this case, Will is referring to business identity. What your business is and who your business serves is all up to YOU. To determine the true identity of your business, you need to have clarity. What type of impact do you want to make? These questions get at the heart of who you are in the marketplace and who you want to serve. When you’re getting started with a business, it’s easy to lose sight of these things. In an effort to find success, many entrepreneurs reach out to everyone and everything. However, to find success you have to get clear and focus on your niche. #Entrepreneurs, here are 2 keys to finding #smallbiz success from @DrWillSpeaks. What do you want your business to do for you? What do you want your business to provide for you? What kind of quality of life do you want your business to bring you? There is not one right answer to these questions; it’s more about how you define success and how hard you are willing to work to get the level of success you want. As Will mentions in our interview, there is room for every type of business in this entrepreneurial world. The important part is to get clarity about whatever level you are reaching for. Clarity about your business identity and appropriate level of scaling will help you put other key pieces of your business puzzle into place. You know what your business is and how it differs from others in the market. You know about (and can market to) your ideal clients. Your understanding of scale helps you develop the structures, systems, and processes that will help you succeed at that level. Clarity is an important first step that will guide the rest of your business operations. It’s obvious that clarity is an important part of success. Think of every successful business and popular brand you know, and you’ll be able to identify clarity. They know who they are, and they can communicate that message to consumers. But if clarity comes first, what comes next? According to Will, after you have clarity, you have to follow through with consistency. Unfortunately, a lot of entrepreneurs and small business owners aren’t consistent. They tend to start and stop, whether it is executing business processes at an operational level, or marketing and handling the customer experience. Consistency is important because it takes that level of clarity that you have for your business and it broadcasts it to the world, so customers also feel clarity with your business message. Consistency isn’t easy, though. It’s easy to be sidetracked by stories of companies that have seemed to jump from zero to a billion overnight. That’s not the case for most businesses. As Will says, “For most businesses, it is a slow hustle.” Consistency takes time and effort. Your business likely won’t make you rich overnight, but the enjoyment comes in knowing that you are pursuing something you want to do for the rest of your life.